A Channel 4 News investigation finds that a number of US and Nato units discreetly turn to help from Afghan militias blamed for assassinations and civilian deaths. Stephen Grey reports from Kandahar. Elite American and Nato military units in Afghanistan have discreetly turned for help from the "private armies" of warlords and tribal leaders as a controversial tactic in the war against the Taliban, it can be revealed. Working alongside both US intelligence and special force agencies, irregular Afghan militia groups are increasingly being blamed for theft, corruption, targeted assassinations. They have also been accused of involvement in raids aimed at killing the Taliban but in which innocent men, women and children have been killed. Nowhere are fears more pronounced about the role of militias than in the southern city of Kandahar, at the centre of a Nato operations this summer to reverse the tide of the Afghanistan war. Here, many say private armed groups are feared more than the Taliban. Assassinations often publicly blamed on the insurgents are frequently carried out, it is said, by what some already refer to as "death squads". "If someone kills someone the government itself says don't touch him," said Shahida Hussein, a local human rights activist who is one of the few who dares to speak openly on the subject. "They say don't bother him (the killer). He's our friend. He's our relative. He has a connection with us." - The gangs of Kandahar - the city's real power? Hussein was speaking as she met the latest victim of a militia – a father whose home was ransacked, property stolen and who was thrown in jail by a well-connected militia that was hired by his son-in-law when he tried to assist his daughter in a divorce. She explained such militias only had power because they had protection and earned cash from both the Afghan government and Nato. "There is no real government here. Kandahar is run by people in the drugs trade, armed with weapons and backed by foreign countries." Apart from working with the regular members of the Afghan Army and Afghan National Police, Nato is increasingly reliant on irregular forces. Gunmen working for warlords protect the main Nato bases, are hired to provide security for Nato road convoys, are paid to provide intelligence used by Nato spy agencies, and are being recruited both to guard villages in the countryside and, most controversially, to work alongside elite military strike forces run by the US. 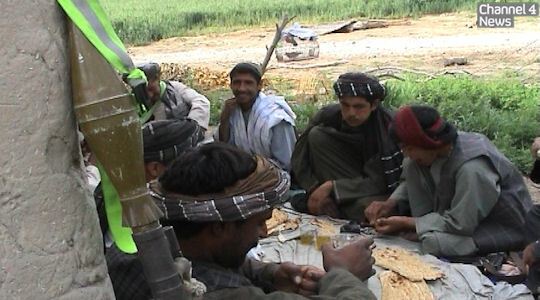 Members of a militia set up by American special forces to guard villages around Kandahar in Arghandab district. The heavy dependence on militias runs counter to official policy dictated in Washington. The term "militia" is a banned word in any public statement, said one senior source. The US is well-aware that warlords and their private armies are despised for their role in seizing control and ravaging Afghanistan after Soviet troops withdrew in 1989. According to one American diplomat in Kabul, however, the dire and deteriorating state of security in the country is forcing commanders to make compromises. "There is no choice but to deal with local power brokers in place and that means the warlords and their men," he said. According to another senior US military source, some of the militias have been "turned regular" by being given uniforms, training and identity badges and officially incorporated into the Afghan national army or police – but despite this he said they were "rarely part of the regular chain of command" and they retained loyalty to the warlords who recruited them and were "almost unaccountable" for their actions, he said. Erica Gaston, a Kabul-based field worker for the Open Society Institute, has studied the issue of civilian casualties for the last two years. She said Nato commanders had yet to address the problem of irregular forces that lay behind many incidents involving the death of innocents. "We often find that the irregular forces are at the root of some serious abuses, partly because when you have an irregular militia that's not part of your regular army, or ISAF or anyone else there's almost no way to bring any accountability over them. You can talk about changing the rules of engagement, or issuing new directives. But that simply doesn't apply to a group of armed men who are simply paid to go in on an operation and add extra force to it." Ever since they arrived in Afghanistan, US special forces units, trained by in the doctrine of "irregular warfare" have recruited Afghan forces to work alongside them. 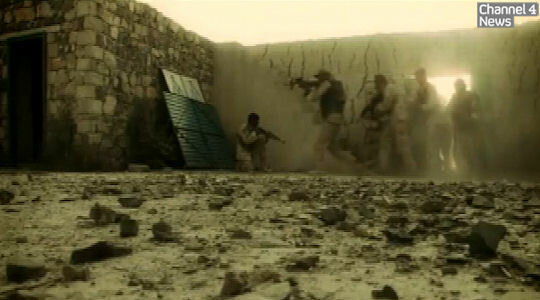 US and Nato forces train an Afghan special forces unit (source: ISAF video). But in recent months, special forces have been under increasing pressure by the US and Nato commander in Afghanistan, General Stanley McChrystal, to let the Afghan units lead raids on suspected Taliban and bear the brunt of the fighting, partly to allay cultural concerns about US forces invading Afghan homes and also in response to accusations the US forces were killing too many innocent civilians. According to senior coalition sources, inquiries into many reported allegations of civilian deaths have often revealed that, allow the Americans got the blame, it was Afghan units involved that were responsible for civilian casualties. One retired Nato officer, with recent experience of commanding special force operations in Afghanistan, said it was "standard operating procedure" to send the Afghan units in ahead of the coalition special forces. "They have a better idea of what to shoot at and also, to be honest, take more of the risk," he said. Stephen Grey's investigation on Kandahar was filmed and produced by Stephen and Afghan journalist N.R., (who cannot be named in full) with additional research by Oliver Laughland. The gangs of Kandahar - the city's real power? Key question in US politics: where would Sarah Palin sit? Powerful reports from Jonathan Miller inside Pakistan. A rare film of Taliban fighters on the Afghan frontline. Lindsey Hilsum reports on the cost of a Taliban deal. Sri Lanka commander says killings were 'ordered from the top'.